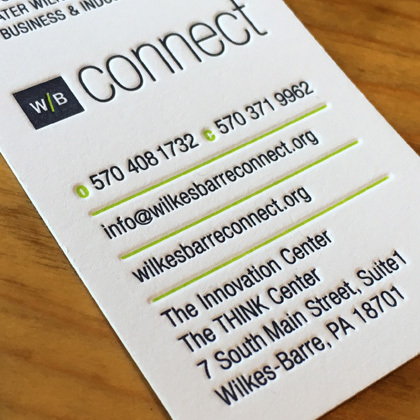 In response to a burgeoning tech-focused business community, the Greater Wilkes-Barre Chamber of Commerce developed Wilkes-Barre Connect, a committee of strategic partners providing free services to support small businesses, entrepreneurs and startups throughout Northeastern Pennsylvania. 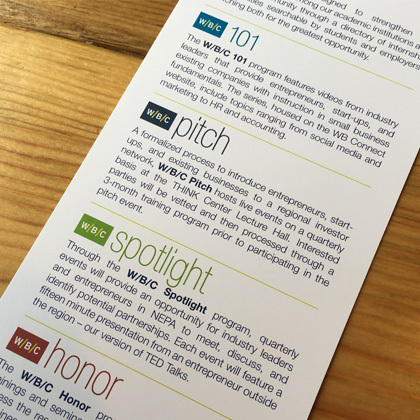 In addition to Wilkes-Barre Connect’s website, BlackOut developed the design of its business cards and rack card. The minimalist design places the focus on the dynamic programs emerging from the group and the colorful, letter-pressed business cards leave a lasting impression with prospective business partners.